The Commons is among the most important and hopeful concepts of our time, and once you’ve read this book you’ll understand why! Think Like a Commoner is a brilliant, accessible, practical, path-breaking intellectual tour de force. A defining contribution to the New Economy movement and an essential read for everyone who cares about the human future. I expect to return to it as a basic reference for years to come. Our world is in need of reviving an ancient wisdom if it is to survive. David Bollier has a beautiful, bold but practical vision for our commons future and lights the path forward. I love this book! "Fabulous and invaluable. I want to hand copies out to people on street corners." Assistant professor at the Nova Scotia College of Art and Design and author of Crises of Imagination, Crises of Power: Capitalism, Creativity and the Commons. The commons is truly the new paradigm, the missing third link for the reform of civilization. But the commons is not a thing, but above all the expression of a cultural revolution and of subjective changes. David Bollier has done a great job of explaining the importance of this great cultural shift. If you’re doubtful that government or private corporations can solve the problems of the twenty-first century, don’t despair. Instead, read this eloquent book. With examples from around the world, David Bollier shows how commoners are co-creating and protecting wealth of many kinds — and how commons, far from being relics of the past, are harbingers of a better world to come. —Peter Barnes, author of Capitalism 3.0 and Who Owns the Sky? It probably surprises you to know that the wealth we own together as a commons is far more valuable than the wealth we and corporations own separately. Corporations know this fact and have commercialized or taken control of what we the people own – such as the public airwaves, the public lands, our genes and trillions of dollars of knowledge (e.g., research and development) paid by taxpayers, for starters. For this and more you must read Bollier’s brilliant distillation of the huge variety of commons and how we can take control of what we own to transform our economy for us, our posterity and the planet. Once you pick it up, you’ll tremble with the excitement of what we all own in the form of the commons that somehow escaped notice in our years of formal education. The biggest “tragedy of the commons” is the misconception that commons are failures — relics from another era rendered unnecessary by the Market and State. 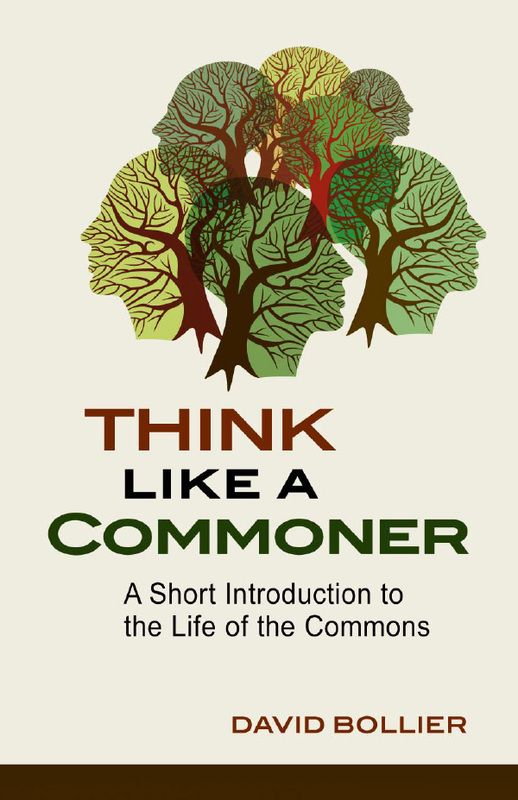 Think Like a Commoner dispels such prejudices by explaining the rich history and promising future of the commons — an ageless paradigm of cooperation and fairness that is re-making our world. Provides a framework of law and social action that can help us move beyond the pathologies of neoliberal capitalism. We have a choice: Ignore the commons and suffer the ongoing private plunder of our common wealth. Or Think Like a Commoner and learn how to rebuild our society and reclaim our shared inheritance. This accessible, comprehensive introduction to the commons will surprise and enlighten you, and provoke you to action. David Bollier has been exploring the commons as an author, policy strategist, international activist and blogger since the late 1990s. He has written and edited twelve books (sometimes with collaborators), including six on commons-related themes — Silent Theft; Brand Name Bullies; Viral Spiral; The Wealth of the Commons; Green Governance; and now Think Like a Commoner. Bollier founded and edited the Onthecommons.org website (2003-2010) before co-founding the Commons Strategies Group, an international consulting project that assists the global commons movement. In 2002 he co-founded Public Knowledge, a Washington advocacy organization for the public’s stake in the Internet, telecom and copyright policies. The American Academy in Berlin awarded Bollier the Berlin Prize in Public Policy in 2012 for his work on the commons. Bollier now works on a variety of commons projects with international and domestic partners. He blogs at Bollier.org and lives in Amherst, Massachusetts. "A convincing account of the common as 'an ethic and inner sensibility'...."
There is a long history of commoners protesting market enclosures — and building innovative new commons. Pages 100 and 126. Credits: Wigan Diggers Festival 2012; Lalo Alacaraz; and Alain Braux.